Savanna Lizards live near the end of a woodland, forest or at the edge of a desert. They are places where the environment transitions. These areas are sparse and may have periods during the year where there is more rain and vegetation. There are many types of lizards found in this sometimes harsh, but vegetated environment. Plants can be in pots. Use a cage with a screen top to keep humidity levels in the lizard cage, low. Note Savannah Lizards is the spelling used in the UK whereas Savanna is used in the U.S.
Savanna Geckos: Savanna Geckos eat crickets that are powered with calcium. This supplement needs to be added to the diet 1x per week. They eat nectar. They will drink from a water dish, but these lizards must be misted every day. Keep plants in the terrarium moist to encourage Geckos to drink from the droplets. Helmeted Gecko (Geckonia chazaliae): This Gecko breed is native to the west coast of Africa and grows to 3 to 4 inches in length. These Geckos prefer daytime temperatures of 85F to 96 F (29C - 25.6C) and nighttime temperatures of 70F (20C). Will drink from a low water dish. Lizard feed for a helmeted gecko includes butterflies, crickets, cockroaches, meal worms and beetles. One month per year is the "winter rest" where the temperature is kept 10 degrees lower. They live in the desert as well as the Savannah. Tokay Geckos (Squamata Gekkonidae): The Tokay Gecko is a nocturnal lizard that grows to 10 inches to 1 foot in length and will live 7 to 10 years. 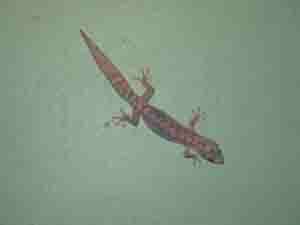 This Gecko is from Southeast Asia and the Malayan Isles. They are found in many types of environments including tropical and subtropical areas, mountainsides, rocky outcrops and in deserts. In the United States they are found in Hawaii and South Florida, and are found around buildings. These types of savanna lizards are characterized by a green/gray color and spots that are orange/brown. The "Tokay" name is based on the loud call or noises made by the lizard.They eat other lizards, insects (crickets, wax worms, wax moths, super worms, locusts, butter worms), frogs and pinkie mice. These lizards can also vocalize and bite. Like other Geckos, they can climb walls. 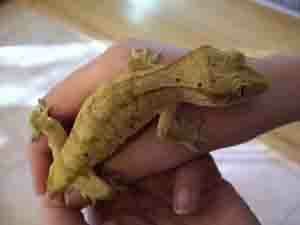 Tokay Geckos are nocturnal and are only for experienced lizard hobbyists since they do not like to be handled. 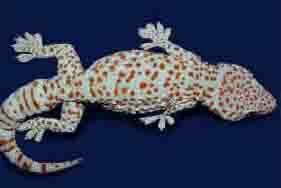 Download this PDF for more information on the Tokay Gecko. Heat: Heat can be used. The Gecko requires 10 hours of light per day. Tokay Gecko's make distinct noises that sound like its' name. They can change skin tone to blend into the environment. 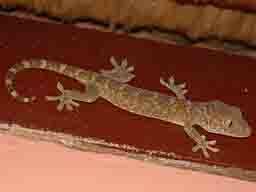 These Geckos are able to cling to surfaces, including the unique ability to walk upside down. Indonesian Skunk Gecko: Kept in small 10 gallon terrariums, although more space is preferred. High terrariums are preferred, particularly in the dimensions of 48 inches long,x 30 inches wide, 66 inches high. Provide opportunities to climb. Australian Velvet Gecko: These savanna lizards very active. Kept in a vertical 15 gallon tank. Terrarium temperature of 80 to 90F (26.7C - 32C) is preferred. Drink water drops from plants and perches. New Caledonian Geckos or Eyelashed Geckos as Pets: This is the type of Gecko commonly found in pet stores that sell savanna lizards. They grow to 8 inches. 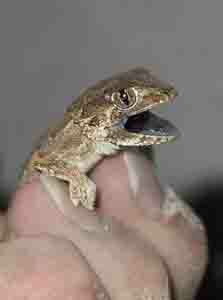 Caledoniam Geckos feed on insects and fruit. The terrarium should be a 30 gallon tank (24 inches long x 12 inches wide x 2 inches high). Curly-tailed Lizards: These savanna lizards are 6 inches to 10 inches long. They eat insects and some plants. The terrarium should be dry with a sand substrate for burrowing. They can dart on rock surfaces, which are preferred in the terrarium. Skinks: This Savanna lizard is found in tropical and temperate regions. They can be a few inches to 2 feet in length. The terrarium should have a floor space of 36 inches x 24 inches and a height of 15 inches. 2 inches of each substrate plus dried leaves and small dried palm fronds. Also include a few layered rocks and limbs. They will drink from a low dish. Fire Skinks: same care as described above. Broad-headed Skinks: Do well on vitamin dusted insects. Will eat canned cat food. Larger Australian Skinks: Requires large enclosure with multiple rock piles. Spiny-Tailed Skinks: Will eat canned cat food. Requires large cages and rock piles. Pink Tongued Skink: Will eat fish flavored cat food. 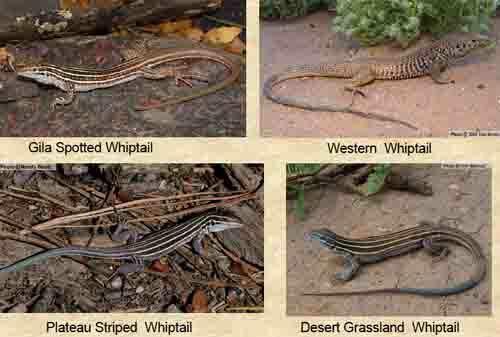 Alligator and Glass Lizards: These Savanna lizards superficially look like snakes and are legless lizards. Characteristics that separates them from snakes include external ear openings, small scales, movable eyelids. They grow in size between 18 inches to 42 inches long, most of which is tail (head to body grows to 12 inches). These lizards eat mostly insects (spiders, earthworms, snails). Hard to capture in the wild without breaking the lizard's tail. May bite a handler. They are called glass lizards due to the likelihood that the tail will break off if a predator grabs the tail. The glass lizard tail will keep on moving after it breaks off. This lizard's lifespan is 15 years. Download a Glass Lizard fact sheet here (PDF Download). Slow Worm Lizards: Eats insects such as slugs, earthworms, centipedes. 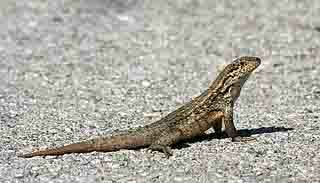 Alligator Lizards: Kept in a dry substrate, and must have fresh water. Will eat canned cat food. 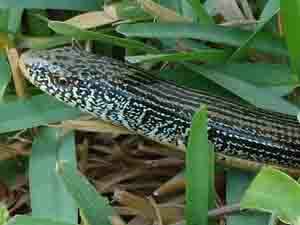 Glass Lizards: Large size lizard that eats insects and mice. Will also eat cat food. Girdle Tailed Lizards: These savanna lizards are between 4 inches and 18 inches. They eat insects and some rodents. They will also eat leaves and blossoms. They will drink from water dishes. They prefer hot, dry, low humidity habitats. Sungazer: 13 inch long type of Girdle lizard. 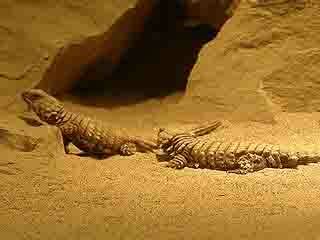 Armadillo Lizards: 4 to 6 inches in length. Feed on insects, like termites in particular. Warren Armadillo Lizards (Ouroborus cataphractus): Native to South Africa. Characterized by rows of sharp spines covering the back of the tail and can grow to 5 to 8 inches in length (150mm to 200mm). Found near termite mounds, their food source. For more information download this fact sheet on the Armadillo Girdled Lizard. Over time, these savanna lizards will get used to a handler and will become tame. They are originally from Southern and Eastern Africa. The name is from the thick scales on their body. Download this sheet on caring for plated lizards (PDF download). Day temperatures are 90F with cool areas at 75F. Night temperatures should be 70F to 75F. Use a reptile heat mat for 24 hour ground heat in a terrarium. Clean the terrarium 1x per week using a 3% bleach solution (remove lizard before cleaning). African Plated Lizards Can live 10 or more years. Eat insects and some rodents, blossoms, vegetation. 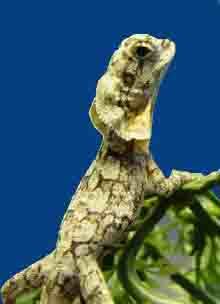 Zonosaurs (Malagasy Smooth scaled plated lizards): Topical lizards that also live in the forest. Rarely bask. Eat insects, anelids, canned cat food, canned dog food, fruit. Prefer daytime temperatures of 77F to 90F (25C to 32C). Jeweled and Green Lacertas: These savanna lizards grow to 18 inches to 32 inches in length. Lacertid lizard diet is small insects, rodents and small birds. Will eat fruit and blossoms. Require large cages since they like to move and climb. Frilled Lizards (also called Frilled Dragons) and Bearded Dragons: These are big 32 inch lizards. Adapt well to captivity. These lizards primarily eat insects, but will eat small rodents and birds. Temperature: Warm basking area of 100F, cool area not less than 70F. Supply radiant heat using a ceramic heater or incandescent light bulb. Native to central Australia, beard refers to skin slap under the chin. Skin flap expands when disturbed. Habitat: 75 or 120 gallon tank is best. Measurement should be 48 in x 24 in x 18 in high. Substrate: Do not use sand or small particles. Best choice is newspaper, repti-carpet or sterile potting soil. Lighting: UVB light from a fluorescent bulb that has at least 5% UVB. Bulb should be more than 12 inches from basking area. Provide 10 hours of light and 14 hours of darkness per day. Temperature: Daytime is 80F-85F. Basking area is is 88F to 95F. Night temperature is 70F - 75F. Under tank heater can maintain minimum night temperature if necessary. These lizards like to bask in the sun to generate heat. Diet (Omnivorous, insect/meat, plant): Feed a varied diet. 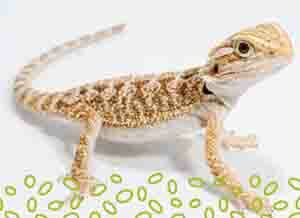 Download this free fact sheet on bearded dragon care from USC (PDF Download). The African Savanna Monitor (varanus exanthematicus) is a popular lizard and can be found in many pet stores. 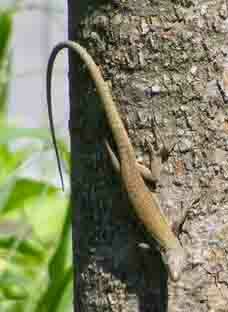 The lizard is native to Sub-Saharan Africa and north of the Congo River. It is gray in color with markets and tough scales. The lizard is stocky in appearance and grows to 2.5 to 4 feet in length (1.52m) - 5 feet is rare, depending on the type of Savannah monitor lizard. The Savannah monitor lizard can puff up its body when threatened. When they do this they are preparing to lash the threat with their tail. They also have claws and the ability to create a bad odor in defense. Substrate: Use a deep 2 foot substrate such as dirt. The monitor likes to create tunnels and burrows. Temperature: Cool size of lizard cage between 75F to 80F. heated area to 90 to 100F. Basking area heat to 11`0 to 130F. Night temperature can fall to room temperature. Heat basking area with rack of 3 to 4 flood lamps at 60 to 120 watts. When held in captivity for many years they can become over weight, and may require that food be limited. Diet: Insects (large roaches), small rodents. Feed a variety of foods daily. Click here to download a summary of Savannah Monitor Care (PDF Download).